Before you read this, throw on Moondance by Van Morrison. Ok once you have the music flowing, roll up and out to find yourself in another time. The age of bronze like tans, long hair and the phrase “keep on truckin” in someone’s back pocket. 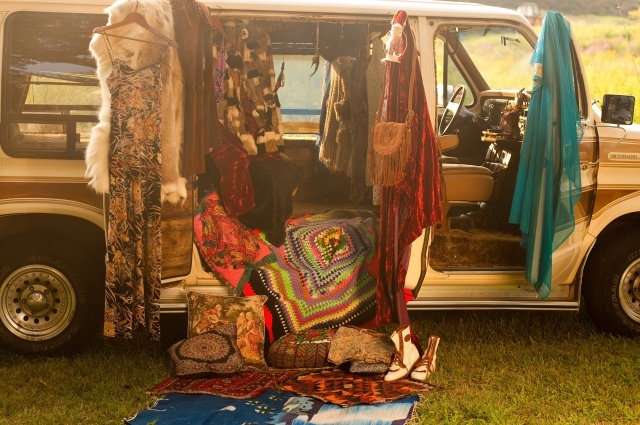 This is the state of mind you feel as you step into the Sisters of the Light boutique; a gutted 1975 Shasta camper decorated with a touch of shimmer, lots of nostalgic for sale on the walls and in bins, as well as pillows where you can hang out. All photos © Eric Truax Also see Lucia Boutique. Sister Sunshine makes jewelry and has designed bathing suits which are sold among the precious retro that they both find and sell as they cruise around the country. Sister Moonbeam may just read your Tarot for free. When you walk into their traveling boutique, you will see the words “Journey of Awakening” written on the wall. This is the expression of their journey. To start a business with virtually no capital is exciting. The idea is to use the currency of freedom and eye for design. To find and sell items that they score along the way. The formula is also mixed with some business savvy tools like an ebay store. The goal starting out is to have fun while learning the ropes of what it means to be an entrepreneur. To see what happens and what works. Learn what the market wants. Their philosophy is that “True artists come together to help each other out”. The sisters willingness to trade occasionally is unconventional in this time but it is surely in their genes. There is talk of traveling to Texas but in the spirit of living in the moment, they will at least hit fashion week in NY (September 8 – 15th). Their 1982 Econoline Van just pulls the camper wherever the wind takes them, and they post about their journey on their blog. They looked at each other and smiled. Both with cat like eyes staring into a mirror. They looked like sisters. I was told they were Virgo twins destined to meet here in upstate NY and start a business. I showed up to the location like I was ready to be in the photo shoot but really I was just there to hang out. I had seen the shop a week earlier in another location but it was dark out, so I couldn’t see inside. Campers in transit don’t have electricity, you know. Hell, it had to be cool inside. 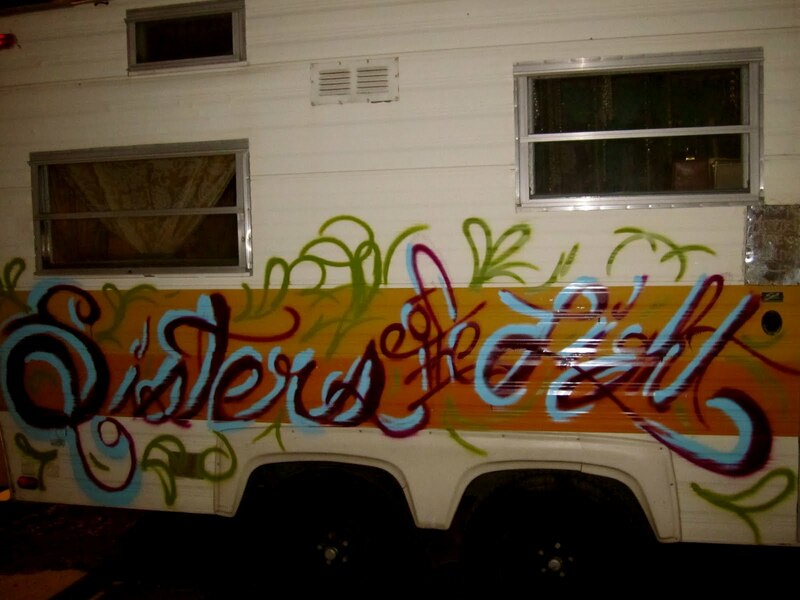 The outside was decked out in graffiti art and Sister Moonbeam is one chill chick. 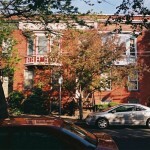 I found an action shot of what I like to call “at will aerosol art” on their blog. The photo shoot was nice and relaxed. Well it was for me. The models had the hard job of keeping up the “pose” for hours. I tried on a bathing suit, eyed the poolslide and bought heart-shaped sunglasses. Ravi Shankar was playing on a battery operated record player. I could easily get into the groove, stare at the fields as the sun was slowly setting and enjoy some August weather.